Cheryl Faas and Aysia Wright knew they were taking a leap of faith when they decided to leave their jobs as attorneys at established firms and start their own practice in a small office in West Linn. 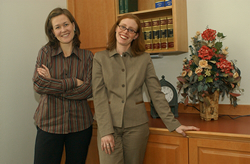 In October, the two women began practicing as Wright & Faas LLC in order to spend more time with their young children. Their decision to open their own firm and specialize in estate planning and elder and family law has been rewarding both professionally and personally, they’ve found. 'This type of practice is much more conducive to family life as well,' Faas added. With three young children — Nicholas, 6; Mary Jane, 3; and Cameron, 18 months — Faas was determined to find a balance between work and family. As a mother of a 3-year-old son named Canon and a 10-month-old daughter named Ele, Wright also was searching for a professional opportunity that would give her more time with her children. A graduate of the University of Virginia’s law school, Wright worked for several attorneys before joining Jaye W. Taylor, an attorney in Wilsonville. Taylor, who was about to merge with another law firm, knew Wright wanted to practice on her own rather than be part of the merger. When Taylor met Faas at a legal aid clinic and heard that Faas had a solo practice in Tualatin, she knew Faas and Wright would make a good team. The two attorneys work so closely together that they are able to share the load of casework that comes in and consult on each other’s cases when clients have questions. They serve as advisers for each other, and ensure that the other doesn’t spend too much time at work. Faas said the firm has the potential to evolve as much as either partner would like. 'It’s nice because it’s a practice that can grow when our kids get older and go to school,' she said. Faas and Wright have volunteered at Washington County’s Sherwood Senior Center and hope to become involved with a senior law project at the West Linn Senior Center, where they can provide legal counseling for seniors on a pro bono basis or at rates seniors can afford. The two also provide educational seminars on estate planning at other senior service centers and venues. Wright, whose interest in the law initially centered around environmental science, eventually would like to spend more time volunteering for environmental causes. Despite Oregon’s economic slump, Faas & Wright has no shortage of clients and appears to be thriving. 'We found at Christmas the estate planning kind of tapered off, and family law actually made up some of the slack,' Faas said. The two are careful to keep expenses low to improve the firm’s chance of profitability. 'I feel like it’s going really well considering we’ve been in business since just October, with the economy the way it is, and for being a suburban practice that is not in the heart of things,' Wright said. The pair said the opportunity to start a practice together not only allowed them to pursue more fulfilling careers and family lives, but also created a partnership that is personal as well as professional. Melody Finemore is a Portland-area freelance writer.